Petty Curse Books, 9781513260815, 440pp. Emit Hopper was a one-hit wonder--twice. First as a rock and roller in the 80s, then as a literary darling in the 90s. Now it's twenty years later, and despite his desire to remain a simple laundromat owner, stardom has found him once again. As he's drawn back into the limelight he meets Julia, a former celebrity chef with a dark past. But when she disappears while hiking with two other women, Emit finds himself chasing down a mystery that promises to leave him forever changed. 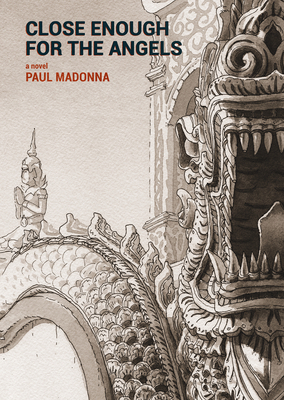 With his signature blend of drawing and storytelling, Paul Madonna (All Over Coffee, Everything is its own reward) delivers a beautiful and entertaining novel filled with suspense, surprise, and humor. Paired with over a hundred lush and haunting drawings from Thailand to Japan, Close Enough for the Angels is a profound visual and narrative ride. Paul Madonna is the creator of the series All Over Coffee (San Francisco Chronicle 2004-15), and the author of three books, All Over Coffee (City Lights 2007), Everything is its own reward (City Lights 2011; winner of the 2011 NCBR Recognition Award for Best Book) and On to the Next Dream (City Lights 2017). His drawings and stories have appeared in numerous international books and journals as well as galleries and museums, including the San Francisco Contemporary Jewish Museum, the Oakland Museum of California, and an upcoming solo exhibition at the Legion of Honor in San Francisco (November 2017). Paul is the former Comics Editor for TheRumpus.net (2009-16), has taught drawing at the University of San Francisco, and frequently lectures on creative practice, even when not asked. He holds a BFA from Carnegie Mellon University, and was the first (ever!) Art Intern at MAD Magazine (1993-94), for which he proudly received no money.